It was 50 years ago next week that one of the great figures of South African rugby died. Bennie Osler was only 60 when he died on April 23, 1962, and his achievements were still fresh in the memory of many observers of the South African game. He was, with post-war loose forward Hennie Muller, one of only two players to give his name to a chapter in A.C.Parker's 1970 history of the Springboks. The chapter on the 1924 to 1933 period left little doubt as to his importance, since it was called The Bennie Osler Era. For that decade he bestrode the South African game, playing every single Test match at outside-half. He was, wrote Parker "the greatest individual match-winner and tactical kicker that South African rugby has produced". More than 40 years on, there are still a fair few experts who would continue to argue that case. Maxwell Price recalled "a stocky, dapper figure, with hands ever ready and always on his toes". He put the fear of God into opponents and sometimes, it would appear, his own team-mates. Parker wrote of him as 'The Great Dictator', subordinating three-quarters to whichever game he chose. An obsessive practiser by the standard of his times, training five times a week in the run-up to the season then four times weekly while playing, he was known to throw passes he considered inadequate back at the guilty scrum-half and to starve his centres if he felt they had not reached the necessary level of fitness. Contemporaries from his days playing for Cape Town University in the early 1920s recalled a sharp and incisive attacker with an eye for an opening. But at top level he was firmly identified with a kicking game, among the first of a line of cannon-like Bok kickers later represented by outside-halves like Gerard Bosch, Naas Botha and Morne Steyn. Parker, who had seen huge amounts of rugby by 1970, wrote that "As a line-kicker one has not seen Osler's equal". The British writer O.L.Owen noted his "ability to plant the ball exactly in the spot most awkward for the other team". 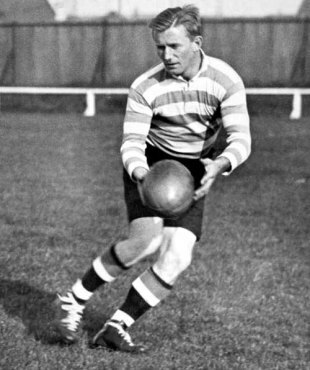 He was also a famed dropper of goals, marking his debut against the British Lions in 1924 with what then counted as a four-pointer and using them to devastating effect in the greatest performance of his career, landing two in his 14 point contribution to the 17-0 beating of the All Blacks at Durban in 1928. Osler took ruthless control of the second-half as the Boks inflicted what remains the second heaviest ever All Black defeat in points terms - it remained top until Australia beat them 28-7 in 1999 - in spite of playing the last 40 minutes with only 14 men. His style was rather less appreciated when he captained the Boks to Britain in 1931-2. The invariably outspoken E.H.D Sewell described him as "a complete failure". Osler himself recalled that "I played the worst rugby of my career". Yet the Boks won all four internationals, albeit without ever attaining double figures and his cross-kicking for wing Morrie Zimmerman proved a lethally effective tactic. It was not as if Osler had not been clear about his game plan, saying before the tour that: "We play to our strengths and would be foolish to adopt any other approach. We have a magnificent pack of forwards and our strategy ideally suits the heavy fields that we will encounter in Britain". In 1933, his final series, there were complaints about the limitations of the Bok game in the five-Test series against Australia. Some accounts report his decision to run the ball in the second Test, which ended in a 21-6 win for the tourists, as almost deliberately aimed at proving his critics wrong, but Price records that he was concussed early in the game and remained little of it. "Any of those young players will have been among the youngsters of the 1920s and 1930s who would shout 'I'm Bennie Osler' as they played in parks and on beaches." But Price also reckoned that Osler may unwittingly have inflicted damage on the South African game, arguing that it was ruined for the following decade at least by "the many young fly-halves who tried to emulate his matchless tactical kicking". Many of those young players will have been among the youngsters of the 1920s and 1930s who, Parker remembered, would shout 'I'm Bennie Osler' as they played in parks and on beaches. His international career was ended by the simple fact of the Boks not playing a Test between 1933 and 1937. When the 1937 team set off for Australasia captain Phil Nel said 'Goodbye to dullness and safety-first methods'. But the legend, and Osler's records, lived on. He retired as the most-capped and highest scoring Springbok with 17 caps and 46 points. Both marks went down against the 1938 Lions when Boy Louw won his 18th cap and Gerrie Brand's 14 points in his final Test took his career tally to 55. But he retained his standing as the most capped Springbok back for the rest of his life, John Gainsford finally overtaking his total in 1963, and remained the most capped outside-half until Keith Oxlee finally went past him two years after that. He was, said Parker, a player who "imposed his personality and technique on South African rugby". Seeing the grinding, ruthless pragmatism which can characterise Springbok teams even in the era of freeflowing Super Rugby, it could be argued that his influence has never entirely worn off.